Advantech manufactures precise quality control products such as test sieves and particle separators including the DuraTap, Sonic Sifter, and DuraShake. Solutions Direct is now the authorized distributor of Advantech’s line of particle analysis equipment; this new addition complements our current offering of material testing products. Sieve analysis is probably the fastest and most widely used quality control procedure due to its simplicity. This process ensures the sampling of organic or inorganic materials meet ASTM standard tests. Particle size distribution is critical to the way the material performs in use. Industries served but not limited to include construction, food processing, laboratories, mining, and pharmaceuticals. 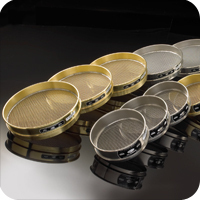 Advantech offers standard test sieves in 8” or 12” diameter in either brass or stainless steel. These sieves come in full, intermediate, or half-height. In wet testing, deep wash sieves make it possible to wash fine materials through the mesh without losing any of the specimens. To achieve small sample separations over the range of 3 µm to 5.6 mm, 3” precision sieves for the Sonic Sifter are available. Pans, covers, and sieve brushes complete Advantech’s line of particle analysis equipment. The DuraTap and DuraShake sieve shakers offer users a reliable and accurate alternative to manual sieving. Each test sieve undergoes multiple points of inspection. All Advantech Test Sieves are serialized to meet the highest grade quality assurance systems for traceability of measurement devices. The serial number etched on each sieve, and contained in a bar-coded label, tracing vital information such as: when sieve was manufactured, which lot of wire cloth was used to manufacture each sieve, and date order was shipped, including all pertinent information from your purchase order. With each standard test sieve comes a Certificate of Compliance applicable to ASTM E 11 specifications bearing the serial number of your sieve and the ship date. The ASTM committee has recently approved revisions to the ASTM E 11-09 standards by classifying three grades of certification. Each grade allows for an increased confidence level of accuracy of test sieves, wash sieves, and woven wire mesh. This gives the customer the ability to evaluate where their sieves lies in relation to the standard. With these add on services, Advantech ensures compliance by employing optical technology to measure the size of the openings and wire diameters within the test sieves for nominal dimensions and permissible variations for sieve cloth. Yet another way to make sure your quality assurance guidelines are met. Founded in 1970 to concentrate on products for the industrial particle separation. The lead product among its offerings was the “Sonic Sifter” which became a favorite for quality control in the dry particle industry. Recognizing the need for high quality test sieves, the company began manufacturing and marketing ASTM test sieves under the ATM brand label. Later, test sieve calibration work was pioneered as a result of requests from sieve and production screener customers for more exacting tolerances. In the early 1990s, the ATM Arrow Testing Sieve Shaker (now known as DuraTap) was added to round out the product line for the dry particle industry. Solutions Direct Online is an online distributor that provides technical products for industrial customers, and strives to provide the highest quality products at affordable prices. A partial list of our products include enclosures, infrared temperature measurement products, material testing equipment, process control & measurement products, and scales & balances.